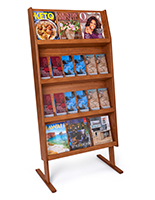 The compact wooden magazine stand is made of solid oak for a durable and classic looking literature display. 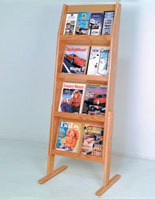 The freestanding rack features an open shelf design that allows for different combinations of reading materials. 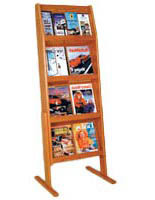 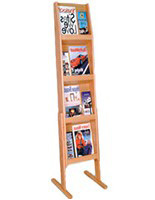 The magazine stand with medium oak finish complements any room décor. 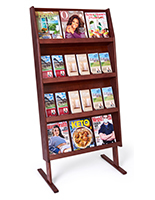 The literature display has wide feet to help keep the unit steady. 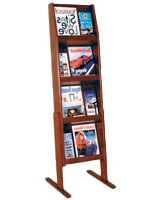 The stand is able to showcase 3 brochures or a single periodical and brochure on each of its 18” wide shelves. 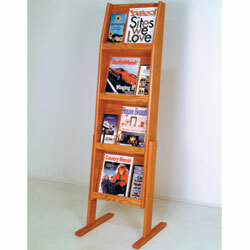 The freestanding design has no front panels and so is best used with bound materials or stiffer booklets.